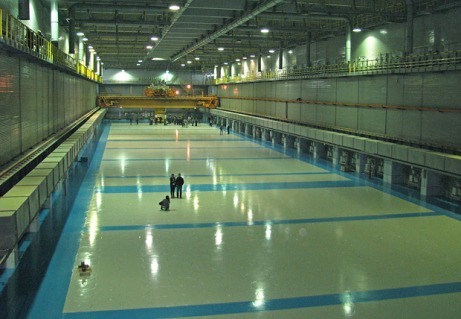 Russia will soon start storing used fuel from its RBMK-1000 and VVER-1000 reactors in a new centralized 'dry' interim storage facility (ISF) at Zheleznogorsk. The first phase of the facility was recently completed and the first RBMK fuel will shortly be delivered. The first phase of a centralized storage facility has been completed at the Mining and Chemical Combine (MCC) at Zheleznogorsk near Krasnoyarsk, Siberia. The initial stage of the facility - which was commissioned in December 2011 - will be used for storing 8129 tonnes of RBMK fuel from the three power plants in the country using that kind of reactor: Leningrad, Kursk and Smolensk. The used fuel from these plants is currently stored in on-site water-filled pools, but these are reaching full-capacity. The first used fuel is expected to be delivered to the Zheleznogorsk ISF before the end of March this year. Transported from the plant sites by rail in special containers loaded with about eight tonnes of fuel. It is estimated that the first phase of the facility will be full within eight to ten years. Later, used VVER-1000 fuel from reactors at the Balakovo, Kalinin, Novovoronezh and Rostov plants will also be stored at the facility. Such fuel has already been sent to Zheleznogorsk for storage in water pools. The ISF - measuring some 270 metres in length, 35 metres wide and 40 metres high - will ultimately hold 38,000 tonnes of used RBMK and VVER fuel. The fuel will be stored in the facility for up to 50 years, during which time substantial reprocessing capacity should be brought online. In the long-term, a geological repository for high-level radioactive waste is planned. Rosatom spokesman Sergei Novikov told the Moscow Times that Russia currently reprocesses about 16% of the used fuel it produces annually. However, he said that the country has set a target to reprocess all of the used fuel it generates each year by 2020. Used fuel from smaller VVER-440 reactors at Russia's Kola plant and the Ukraine's Rovno plant, as well as the BN-600 at Beloyarsk and from naval reactors is sent to the Mayak Chemical Combine in the Urals for reprocessing. Dry nuclear fuel storage technology is said to have a number of advantages over 'wet' storage technology. Dry storage, for example, does not require storage pools and the casks in which the fuel is stored can withstand large impacts and temperature changes.